IDF soldiers use a dog on a PA Arab who behaves wildly during a violent demonstration in Samaria. 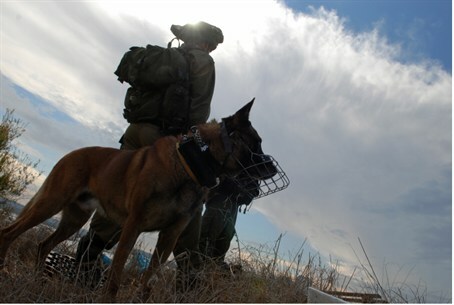 IDF soldiers used a dog on a Palestinian Authority Arab who behaved wildly during a violent demonstration in the town of Kafr Qaddum in Samaria. The dog bit the demonstrator in the arm and caused ​​him bleeding. The Arab received medical treatment by IDF forces and did not need to be taken to hospital. Another protester was arrested. The IDF said that the Arab demonstrators rolled burning tires towards Israeli security forces and threw stones at them. Kafr Qaddum, which is located near the Jewish community of Kedumim, has recently become a point of friction between the IDF and Arabs who protest there on Fridays, usually joined and encouraged by leftist activists. The protesters often try to enter Kedumim but the IDF and Border Police block them. This friction is in addition to the violent demonstrations which take place every Friday near the Arab villages of Bilin and Naalin.